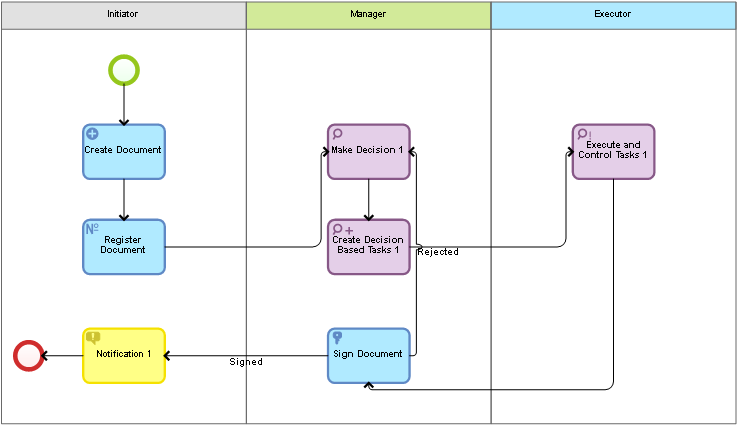 You can model a business process, in which a document is created, registered and sent for consideration to a head of a department. The head makes a decision and assigns tasks, if necessary. When the document meets the requirements, it will be signed and the process initiator will receive a notification. 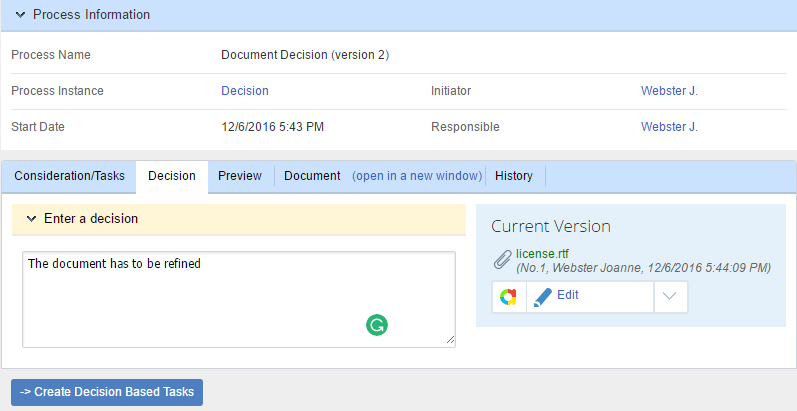 When the initiator starts the process in Web Application, the document creation task opens. 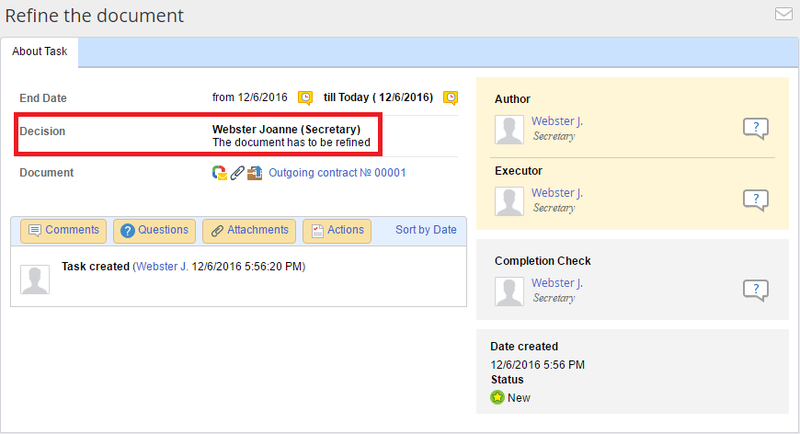 At this step, the initiator fills in all the fields, required for creating a document. After adding data, the process moves on to the document registration task. At this step, the document is registered in the system and assigned a registration number. This operation requires a properly configured records classification scheme. You can find instructions on configuring a records classification scheme in this article "Records Classification Scheme"
At the decision-making step, enter your decision about the document in the respective field. Then create decision-based tasks. 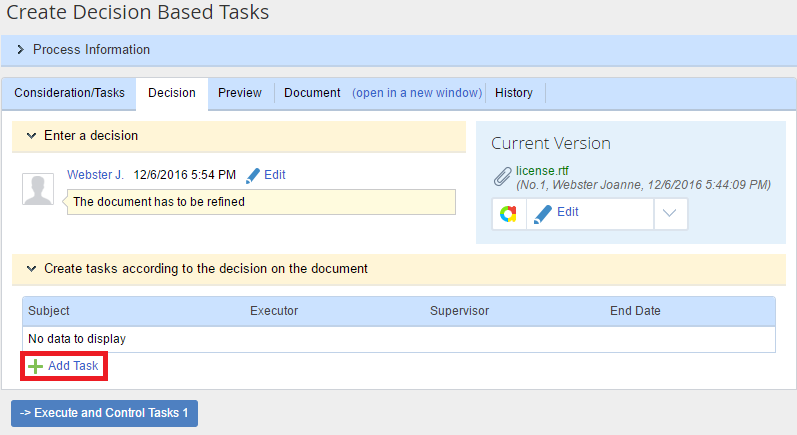 «Create document-based tasks» - create ad-hoc tasks aimed at fixing deficiencies of the document. To create a task, click Add Task and fill in the required fields. The page of the decision-based task will display the decision. Completion of the decision-based task has to be checked. After that, the process will continue. «Sign» - at this step, the user decides whether to sign the document. If the document is not signed, then the process returns to the “Make a Decision” task and all the subsequent tasks will be executed again. This cycle will repeat until the document is signed. After the document is signed, the process ends.